Denso's 24V Planetary Gear Reduction Starters are designed for your toughest applications. 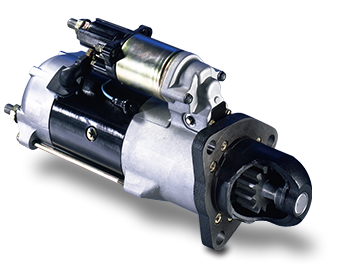 This starter is commonly used for Transit Bus, Coach and Off-Road Equipment applications, such as Loaders and Cranes. Its compact, lightweight design ensures easy installation and a long, reliable life under rigorous conditions. The 12 tooth (DP6/8) pinion crosses with the competition's 11 tooth gear design, and replaces the Delco 50MT. For 35 years, the biggest names in engine manufacturers have chosen one name in cranking power—DENSO. As the world’s largest starter manufacturer, our starters simply install faster and perform better under adverse conditions. The Denso commitment to quality, durability, performance and innovation is the reason our components are truly better by design. 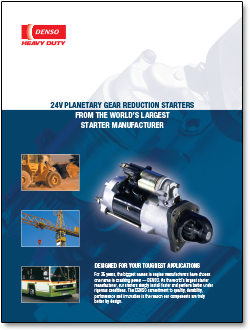 To purchase a Denso 24V Planetary Gear Reduction Starter, click here for the MurCal web store.